If you only read one sponsored post this year, please PLEASE make it this one, for both yourself AND for your kids. 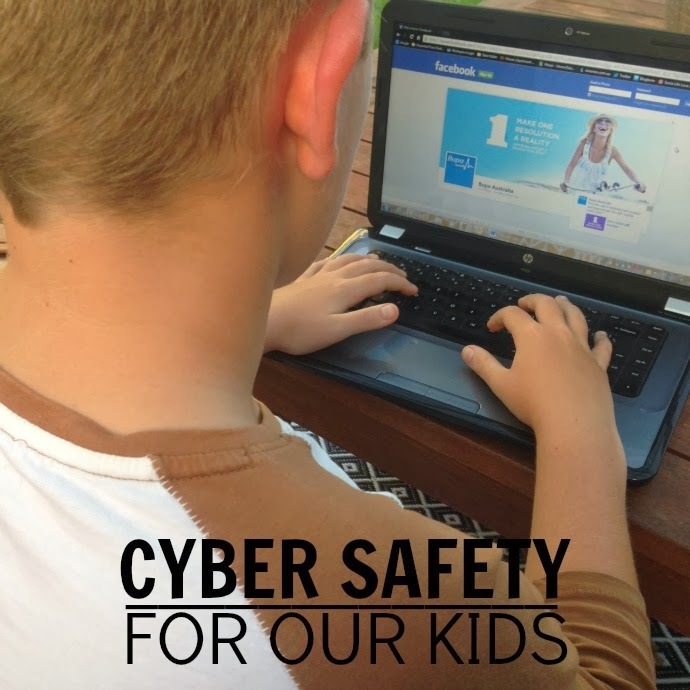 As a parent who is raising my boys in a world that is driven by technology, boys who will for both educational and social purposes have an increasing need to spend time online, Cybersafety is a subject I feel very passionate about. For a number of years now my family has enjoyed the benefits that technology like the internet affords us. We have used social media and various internet services to chat with other family members and to stay in touch with friends who live interstate and overseas. My kids see me working, blogging and chatting to my online community every day and all three of them like to Facetime us to say goodnight whenever they are at sleepovers. They know how to use the internet to research a school assignment and as far as they are concerned (and me for that matter) Google has an answer for everything. They have even learnt how to build, maintain and ride a skateboard from watching tutorials on You Tube, so it is no surprise they feel so comfortable with the concept of living in an age where the online world exists as much as the world we can touch. With my oldest son fast approaching his teens, Instagram, Kik, Snapchat, Vine, Skype, Facetime, You Tube and many other flavour of the month apps and websites are both hot topics and completely the norm among his peers. Working online myself, I am aware that a darker side to the internet exists and the threat that online predators and cyber bullying poses to not just our kids but all of us. It was for those exact reasons I was hesitant about giving my sons access to the online world. But I also realised that by sticking my head in the sand and saying “no” when he asked for our permission to use these apps and websites, I was not only at risk of making him feel excluded and alienated from his friends, but I could possibly lead him to be tempted to access them behind our back. If we want him to develop his maturity and responsibility then we need to give him the opportunity to prove he is worthy of our trust and capable of navigating through both the good and the not so good components of the internet. In this day and age, a lot of school work is done online. Our kids need access to educational info, classrooms have blogs and social media is a popular way for them to socialise outside of school hours. 95% of the time the internet and social networks are safe and fun, but it is important that we are prepared for the other 5% when things have the potential to go wrong. Obviously it is not just a case of sitting our kids down, setting some guidelines and then letting them go for it. We need to stay abreast of the trends and risks involved with our kids being online. The best protection we as parents can give our children is to arm ourselves and them with the facts and the knowledge about the world they play in and we need to feel comfortable in having conversations with them should any concerns ever arise. After gaining our permission and agreeing that from time to time we would like to look at the content with him, the first app my son wanted access to was Instagram. Within a few weeks of setting up his account I had concerns about some of the people that were 'requesting' to follow his private account and I was also concerned about the obvious validation kids were seeking from the likes and comments on their selfies from their peers. As a blogger, I know how disheartening it can be if I write a post or share a picture on instagram or Facebook and not get as many likes or interaction that I had hoped for from people who follow me. Imagine how tough that would be for a young kid who is not yet mature enough to process that kind of rejection. All of these concerns I had confirmed to us the importance of ongoing discussions with our son about maintaining behavioural guidelines and personal security whenever he is online. Given I make a living out of social media, I like to think I can keep up with my kids when it comes to online trends. But for many parents, they may discover that their children are far more savvy then them when it comes to the internet and technology. So how does one get access to the important information that you need to make sure your kids are safe when they are online? Chatterbox from Cybersmart is a series of downloadable audio clips in a conversational format. They give parents access to up to date and jargon-free information on cybersafety. You can participate in discussion forums with other parents and have access to various cybersafety resources that will equip you with all you need to have that all important cybersafety conversation with your kids or answer any questions that your kids may have. The Chatterbox conversations can be downloaded and accessed whilst you are at home, or on a mobile device so that no matter where you are you have a go to place for the latest in cybersafety tips and trends. Each Chatterbox episode runs for approximately 12 minutes and new episodes will be released on a regular basis throughout 2014. Through the discussion forums, parents are encouraged to pre-submit questions to a team of cybersafety experts and you can also share stories and advice with other parents. Please take a minute or two to watch this video to understand how chatterbox can help you help your child stay safe in the online world. There is a live cybersafety discussion on Tuesday between 12pm and 1pm and I encourage every parent whose is concerned about cybersafety to get involved. When: Between 12pm and 1pm on 11th February 2014. How do you as a parent manage your kids and their use of social media?